Typically 1 1/2, 1 3/4 & 2"
We can make a wide variety of circular stamps. Most follow a standard pattern with arcs of curved type top & bottom and other information or a logo in the center but custom layouts can be created to suit your needs. 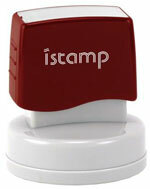 Common uses include engineers, architects, surveyors and other professionals who need stamps for marking papers. The newly required* EPA Lead Safe Certified Firm stamp is now available. We make them in a special green color in an attractive iStamp pre-ink case that comes with a snap-on dust cover. We do need a copy of your Lead Safe Certified Firm certificate to make this stamp. The copy can be mailed, emailed or faxed to us along with your order. Contact us for further details. Traditional hand stamps can be made to any dimension. 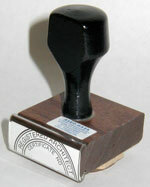 Standard hand stamps are made in photopolymer for use with ordinary stamp pad ink. They can be made from natural rubber or neoprene to match special inks. 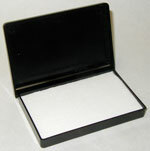 Stamp pads in a wide range of colors are available separately. 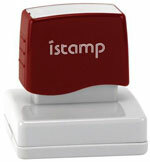 These handy self-inking stamps have a stamp pad built right inside. They are made to mark plain paper only and will make hundreds or even thousands of impressions. They are easy to re-ink with ordinary stamp pad ink. Available in black, blue & red. The Ideal 400R & 500R cases have a very special feature. The dust cap holds the stamp in a collapsed state for storage so that the stamp is more compact. Just push the stamp down into the cap & it snaps into place. The iStamps are a compact pre-inked stamp that give a great impression and extended intervals between re-inking. 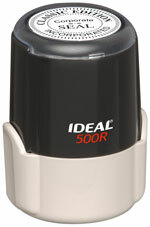 The handles pull off and iStamp ink can easily be dripped on to the internal pad give thousands of additional impressions. 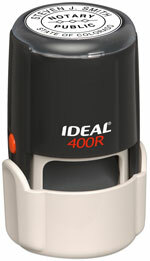 If a compact casing size is important, these iStamps can't be beat. Available in black, blue & red.